Elephants, ramps, pulleys, and lots of manual labor. Long before the arrival of modern engineering, ancient structures were brought to life in impressive and mysterious ways. While it’s hard to imagine constructing buildings today without modern machinery, human beings challenged physical limitations to create some of the world’s most enduring, visionary wonders. Since those ancient times, construction has changed significantly – from the way we transport materials to how we assemble them. These advances make us wonder how much it would cost to recreate famous ancient structures in the modern age. 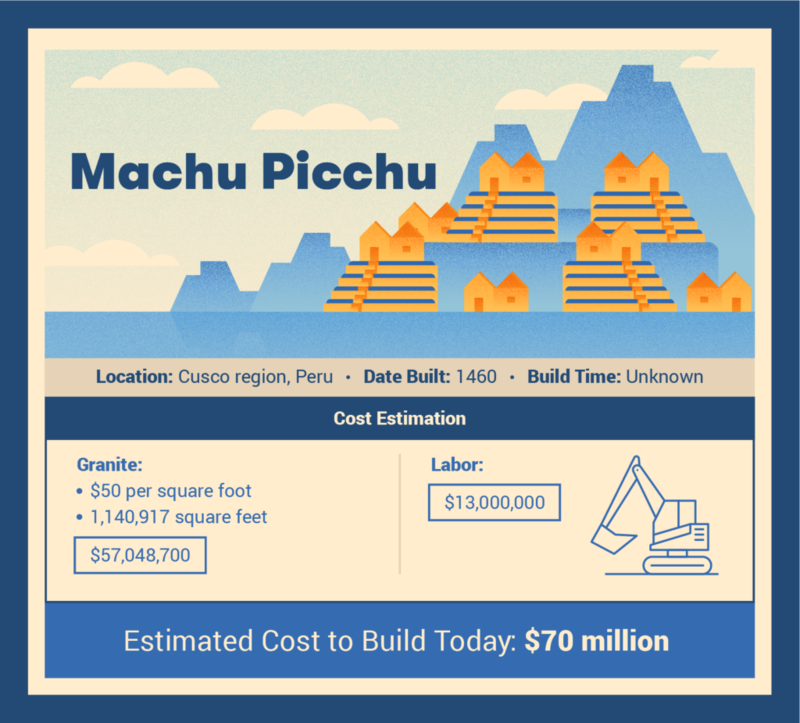 To find out, we looked at the materials, dimensions, and building processes used and estimated the cost of nine iconic wonders. Stonehenge is said to originally contain around 160 massive megaliths—80 sarsen stones and 80 bluestones. To estimate the material costs, we multiplied the costs per ton of both sarsen stone and bluestone with the estimated weights of the stones used in the original structure. A Stonehenge replica in Australia required 140-ton cranes and labor to construct over a two year period. 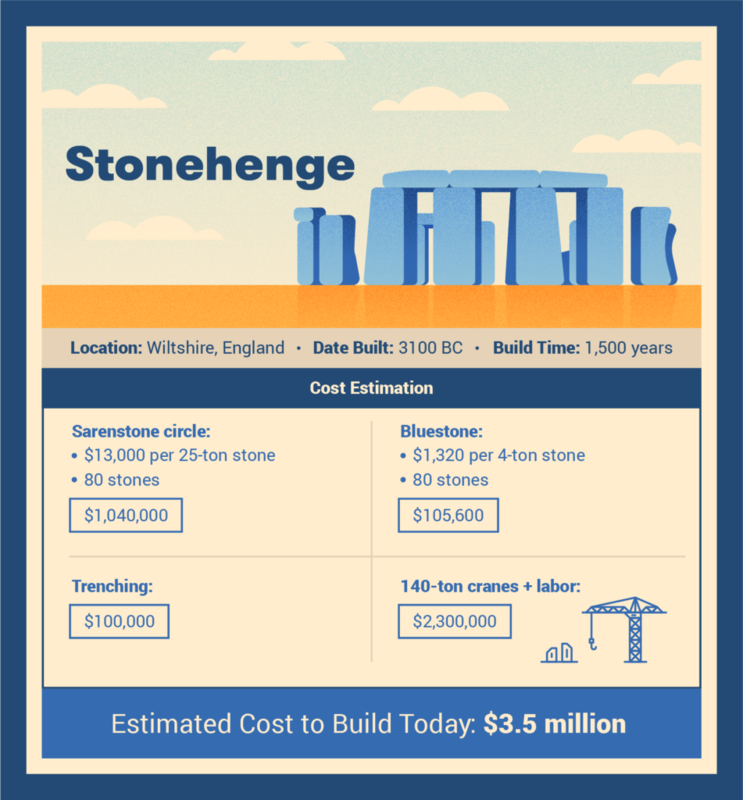 A similar plan for our Stonehenge would cost an additional $2,300,000. 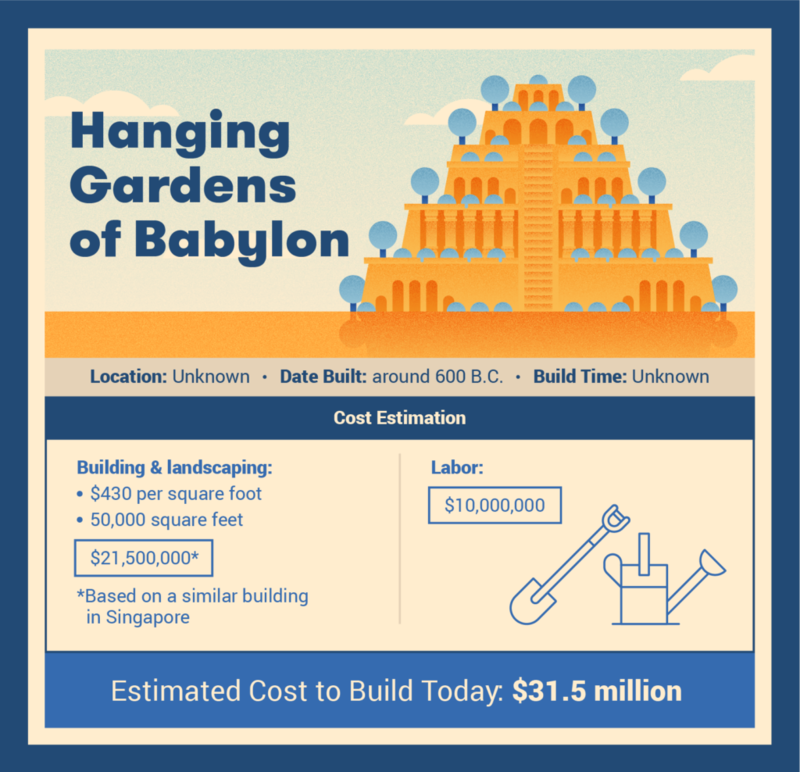 While there are no remnants of the ancient Hanging Gardens of Babylon that exist, Greek historian Diodorus once stated that the Garden was 100 long by 100 feet wide. In our research, the Garden is often depicted with five stories, which would make its overall floor plan approximately 50,000 square feet. A larger modern-day equivalent, the Parkroyal Hotel in Singapore, cost about $430 per square feet to build, putting our total cost to build today at $31.5 million. The Parthenon was constructed with approximately 100,000 tons of cut marble. With the average per ton cost of marble valued at $304 from the U.S. Geological Survey, we estimate the total materials to be around $30 million in costs. 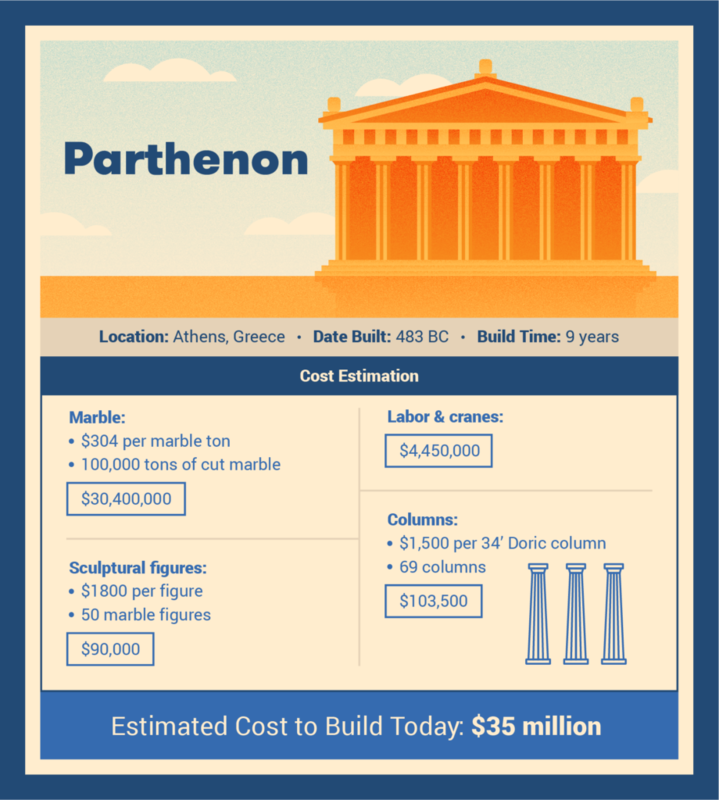 In addition to a marble structure, the Parthenon is known for its 34-foot high Doric columns—which we calculated by scaling up the costs of smaller columns—along with 50 impressive marble figures sculpted into the frieze. 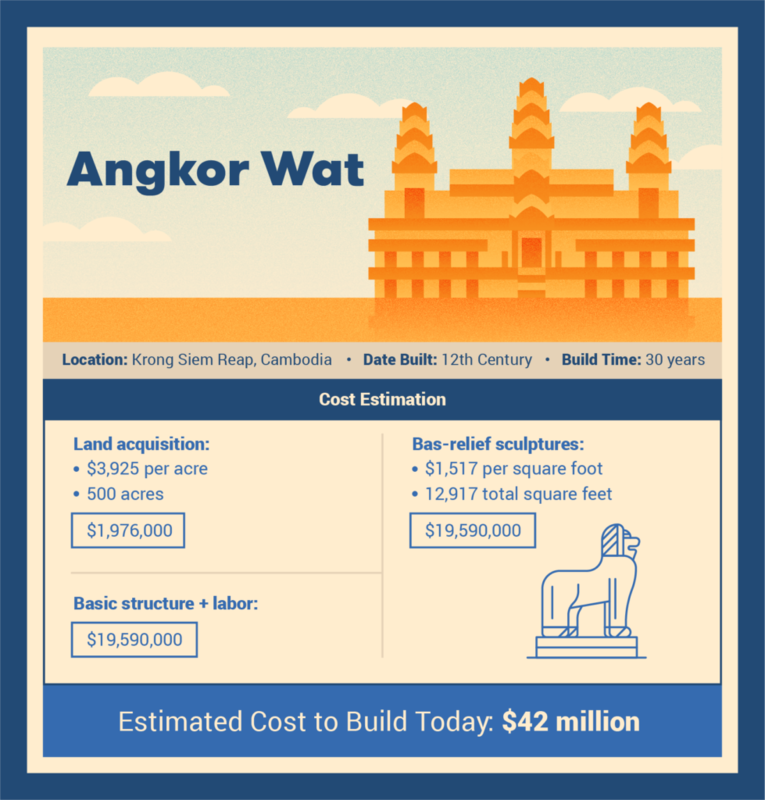 To set a base for Angkor Wat, we factored in the planned cost for Viraat Ramayan Mandir, a future Hindu temple estimated to cost $78 million to construct. Given that it is half of the size of India’s temple, a modern-day Angkor Wat would cost about around $39 million to build. A shelved replica in India also projected construction costs to be split between the building and prominent sculptures, which we used to estimate our cost breakdowns. Machu Picchu spans an impressive 125.8 square miles, with an estimated built area of about 530 meters long by 200 meters wide with 172 campuses. Converting those numbers into 1,140,917 square feet, we multiplied that floor size with the average cost of granite per square feet of $50 to get our $57 million material costs. 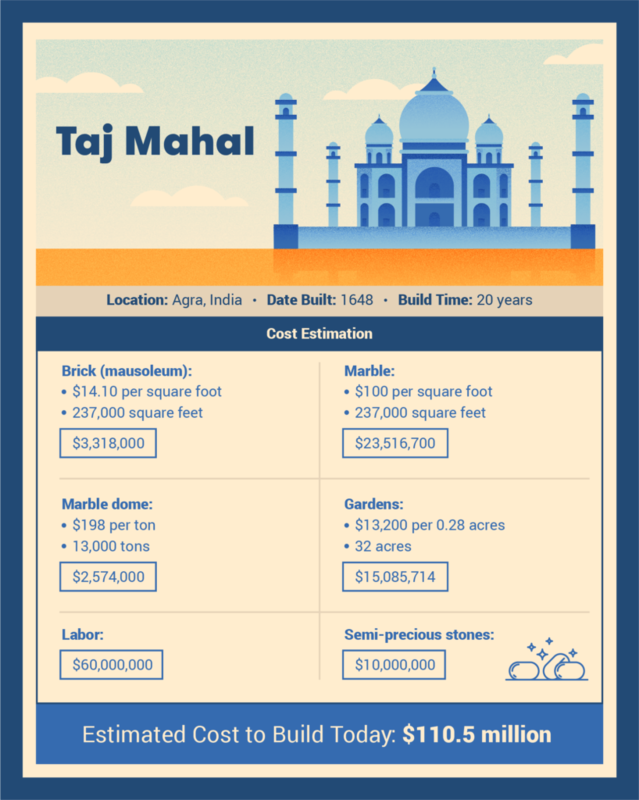 Using reported dimensions, we calculated the Taj Mahal’s main mausoleum building to encompass around 237,000 square feet. We then multiplied the size with the average marble and brick costs per square foot. We also calculated the size of the structure’s gardens using designer landscaping costs, as well as factored in the cost of the smaller replica in Bangladesh to arrive at our total cost to build. A similar structure to the Roman Colosseum is its counterpart in Las Vegas, with construction costs of $142 million in today’s dollars. Using the elliptical structure’s 197,000 square feet size as a base, we calculated the cost to a similar structure at $824 per square feet. A 261,36- square feet Colosseum recreation, then, would require around $215 million in structural costs. The Colosseum also required about 1 million tons of travertine, which would add an additional $198,000,000 to the plan. An estimate from HomeAdvisor puts labor costs at around $22 million. The Great Pyramid of Giza is said to have been constructed with 2,300,000 blocks. 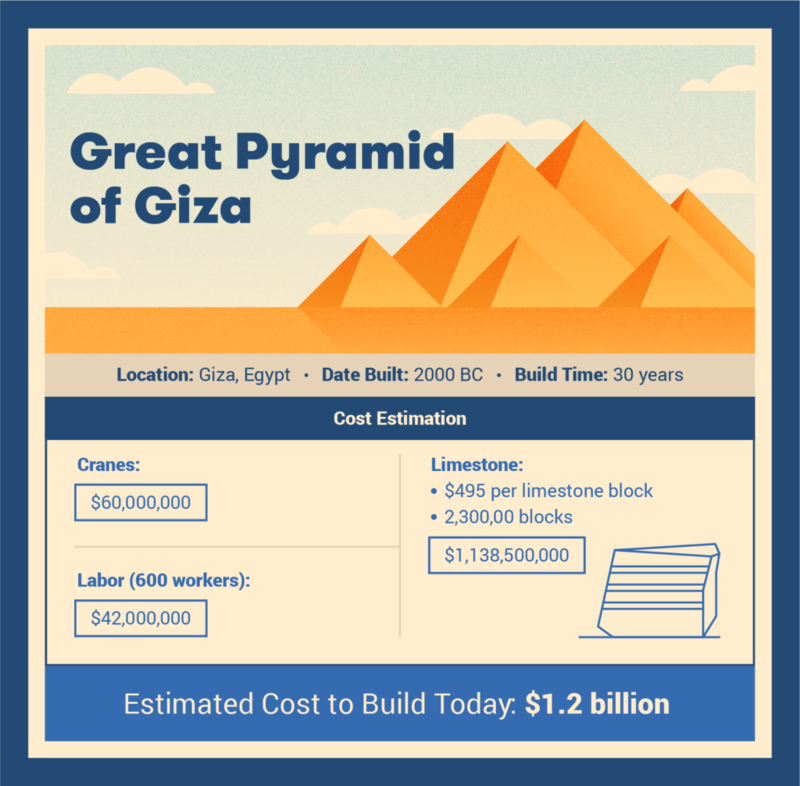 We multiplied the cost per ton of limestone by the average weight of the Giza blocks (about 2.5 tons) to get our material costs of $1.14 billion. With labor estimates of approximately $102 million from HomeAdvisor, we estimate the costs to build the Great Pyramid today to be a whopping $1.2 billion. A scaled replica of the Great Wall currently lies in Nanchang, China. With estimated construction costs of around $600,000 for 2.5 miles of wall, we can assume that it requires about $303,000 per mile to construct a full-scale wall. 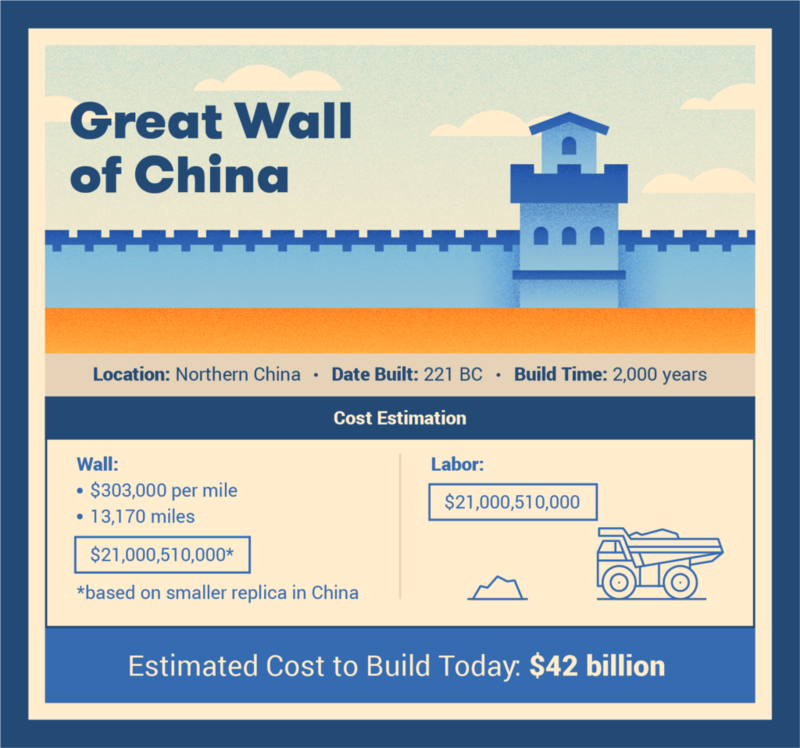 Since the Great Wall is over 13,170 miles, we multiplied the amounts to arrive at $21 billion in construction costs. Labor costs in China are roughly half the total amount—a construction estimation of $21 billion means labor costs would also be approximately $21 billion, making the total cost to build $42 billion. Ancient structures serve as perfect examples of engineering feats, withstanding the test of time and gaining recognition for their immensity. While modern technology would have sped up the construction of these icons as well as cut down the workforce, they are just as challenging and costly to build today as they were during ancient times. These obstacles, though, were never limiting factors in human beings bringing to life some of the most marvelous structures history has ever seen.